Added by Eric Mesa almost 4 years ago. Updated over 3 years ago. When I check with EXIFTOOL, the tag, title, and description are in both the CR2 and the JPEG, however, Digikam (which uses Exiv2 and told me to come here with this bug report), only sees the description, not the title and tag. Warning: Ignoring XMP information encoded in the Exif data. Why does it say it's ignoring the IPTC info? Because that's where, I'm pretty sure, the info is stored. What did you set the tag and title to? Eric, have you set digikam to "If possible, write Metadata to RAW files (experimental)"? 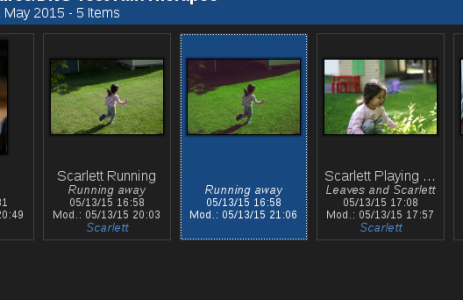 The title is "Scarlett Playing with Leaves"
It's all in both the cr2 and the jpg, but the XMP is embedded inside Exif ApplicationNotes as shown by exiftool. Thanks for tracing things across both bug trackers. "Ok, it looks like what exiftool calls ApplicationNotes, exiv2 calls Exif.Image.XMLPacket." What are your thoughts at this point? Where does the issue appear to lie? It appears that exiv2 has no method to read XMP metadata when it is stored in Exif.Image.XMLPacket. Bummer that it's for 0.26 as that comes out next year at best. At any rate, just for completion's sake on the changed subject of the bug - it's actually able to read the CR2 file in Digikam as that's where I tagged it. It's the JPEG that's created where it can't read the data stored in Exif.Image.XMLPacket. In other words, I tag the files in Digikam. And Digikam can read the tags on the DNGs and CR2s. It's only the created JPEGs that can't be read. Which seems to be weird, based on where it's stored. Or maybe Digikam is doing some extra stuff on the side like a Database or something? It's tough when we have 3+ programs interacting. Also, this holds for DNGs as well as CR2 raw files. Finally, it's weird that Exiv2 puts the data there, but then can't access it again....or maybe I've misunderstood something subtle. That JPEG file was created from the DNG using RawTherapee? What's interesting is that since LR made the first tags, Digikam/Exiv2 put their tags in there too. Yes, Digikam tries to be as interoperable as possible, mapping a wide variety of proprietary tags as well as following MWG guidelines. Exiv2 just provides the background functions to allow that to happen. Certainly looks similar. I'll mention it on their bug forums. When I look at the JPG image from dropbox, there is no metadata whatsoever. I think Dropbox has removed the metadata. Can you help me to help you? What is the question? I've goofed up with Dropbox. I'm right and wrong. Right - the image displayed in the browser by dropbox (unspecified.jpeg) is a JPEG with no APP1 data segment. Zapped. No metadata. Wrong - when I click "download", I get the original JPEG with the metadata. I'm also surprised by the "Warning: Ignoring" messages. I've never seen them before. I didn't write exiv2, I'm the project's build engineer. However I wrote -pS|X|C|R to learn more about how metadata is stored in images. I am really lost in this discussion about DigiKam, RawTherapee, DNGs, JPEG and CR2 files. What is the question? Robin, if I recall correctly, we are trying to print out all the Xmp.dc. * values that are embedded in Exif.Image.XMLPacket in the Pots.jpg file. How that XMP data got into Exif.Image.XMLPacket is what all the discussion about DigiKam, RawTherapee, DNGs, JPEG and CR2 is about. Ah, right! Gaaazzzunk. The Penny has Dropped!!! Ching. There are two different file parsers in exiv2. The ones written by Andreas and Brad and the ones I wrote which handle -pX, -pR, -pS, -pC. Mine know about XMLPacket and I suspect that Andreas/Brad parsers don't. However Pots.jpg has revealed an interesting bug in -pX which I'll fix this afternoon. No problem. It does however have an XMLPacket embedded in the exif data (which is a TIFF formatted data-structure). 4) Have a read into the Andreas/Brad code. I'm not promising to change that code, however I will investigate. This team work stuff works. Thank you for the clarification. I don't intend to do further work on this. Somebody will have to swim upstream to determine who wrote this illegal file. I don't believe it was written by Exiv2. "I don't believe it was written by Exiv2." I'm the OP and I was following your progress today. I created the file with Digikam and they use Exiv2 for their metadata. Could they be using Exiv2 incorrectly or something? I'm closing this. Please discuss this with DigiKam. I can only deal with issues which can be demonstrated/reproduced with the sample applications distributed with our code. I'm reopening this issue. We need to painstakingly investigate what has happened here. We can't guess. I apologise for being so cross. Jumping to the conclusion that Exiv2 is 100% to blame is not helpful. It would also be constructive for you to thank me for the effort I have invested into your issue. Let's go back to the start. I've download the original CR2 and JPEG files as MG.CR2 and MG.jpg. There is an XMLPacket in the CR2. This is not the original file from the Camera. It has already been modified by DigiKam - as you can see in the Xmp.xmp.CreatorTool. It has no XMLPacket (as demonstrated by Pots.jpg). I don't know how the CR2 was converted into a JPEG. To my knowledge, Exiv2 does not do image format conversion. The XMP has been lost in that conversion. I recommend that you discuss this with DigiKam as I don't believe we performed that conversion. The discoveries about Pots.jpg are interesting, however I don't understand the genesis or relevance of that file to the discussion. I didn't write the code that generates those messages, however I'll step the code in the debugger and discover what this is about. The new file has an APP1/xmp segment and does not have a XMLPacket. It does however have an ICC profile. I'm adding ICC support in v0.26 and when that is finished, metacopy will be updated appropriately. Until v0.26 ships, Exiv2 does not provide support for ICC profiles. So there is strong evidence that DigiKam has used some other software to do the image conversion and lost the XMP in the process. The question for exiv2 is if we can get inside that XMLPacket and return the XMP values to the user. I think this is a feature request rather then a bug in exiv2. For certain this is not a bug in Exiv2. I almost understand this now. I thought DigiKam was involved. It's RawTherapee that is the culprit. He has converted the file to JPEG and preserved the XMLPacket. That's a violation of the Adobe spec. They should put the XMP into the APP1 segment of the JPEG. This is the behaviour observed in Pots.jpg. We're on the same page now. Phew! I can easily get -pX to read the XMLPacket. I haven't investigated the Andreas/Brad file parsers, however I think it's probably easy. However, if we rescue the situation, there will be no pressure on RawTherapee to fix their code. We are blessing a violation of the Adobe spec. You've got a tough sell to persuade me to do that. We could add an option to exiv2 --fixXMLPacket to repair the JPEG. We have a precedent for this when I agreed to implement -dI to fix files with multiple PhotoShop APP13 segments. #922 I still haven't dealt with -dI yet and maybe we can implement both as the single option --fixJPEG. I don't believe that is blessing a spec violation - quite the opposite. We are providing a utility to enforce the specification. The user has to run the command, we shouldn't do this automatically. If we decide to adopt this solution, I don't need to look at the Andreas/Brad file parsers and they will continue to issue their warnings. This is good. Andreas and Brad have done a great job and I will only modify their code if I find a bug. I don't think we should be in hurry to implement this. Perhaps some pressure can be applied to RawTherapee. On this evidence, they don't appear to be using Exiv2. I'm willing to work with them to integrate libexiv2 into their product. However I don't have time to work with them until v0.26 is code-complete in April. Eric, please work with the RawTherapee folks to fix this on their end. Robin, for this feature to be useful to users on Digikam and other existing applications, it needs to work with the default exiv2 command line. "exiv2 pots.jpg" should display the XMP values hidden in XMLPacket. Fixing data errors in broken image files is another can of worms. If exiv2 can provide a way to read the data, other utilities can use that to fix broken files. I don't think exiv2 needs that feature internally when it can be provided by an external program. One thing is 100% certain. There is no bug in Exiv2. The behaviour of our code is correct. If we read that file and silently forgive the error, RawTherapee will do nothing about their bug. The Andreas/Brad file parser correctly issues warning and ignores those tags. 1) We close this issue. This new issue can skip most of the detail discussed here (however the new issue should be linked to this). I've asked Andreas to review all 1.0 issues before we ship v0.26. We can add Phil as a watcher on the new issue. Phil is really smart and will say something interesting and clever about this. I'm going to close this. It's not a bug. I'll open a new issue to consider reading the illegal XMP and IPTC data from the Tiff-Encoded Exif. The target for that issue will be 1.0. So it will be reviewed as part of the v0.26 release process and a decision made about the best course of action. I'm assigned this to Alan. Alan's the guy who really understood this issue and dealt with RawTherapee. Great Job, Alan.